The 1960’s was the most creative, the most turbulent, the most exciting, and the most entertaining decade of the last half of the 20th Century. It was an era of new styles, new ideas, and fabulous new music. It was the era of The Beatles; The Beach Boys; The Rolling Stones; The Association; The Doors; The Four Seasons; Crosby, Stills and Nash; Simon and Garfunkel; Peter, Paul and Mary; as well as the Motown sound of The Temptations, The Supremes, Smokey Robinson, and Aretha Franklin and much, much more! This season we continue our tradition of spectacular live band shows with a tribute to that unforgettable decade! 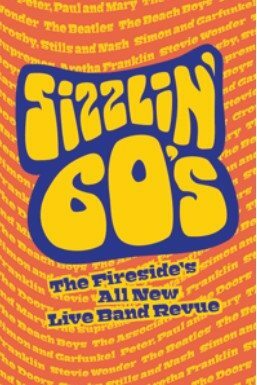 From the creator of VIVA VEGAS comes this all new production featuring audience favorite Steve Watts and The Fireside Band and a cast of talented singers and dancers in a dazzling, fast-moving, sizzlin’ extravaganza. Fort Atkinson – 1131 Janesville Ave. The Gold ‘n Blues became Marquette University’s first recognized coed a cappella group in the spring of 2008. This is a 19-member group and has exploded in recognition on campus and city-wide. From singing at the “Best of the Midwest” a cappella concert, to the National Anthem at sporting events, this group has come a long way from Open Mic Night! 7pm Friday night. The Team Trivia Contest is back! 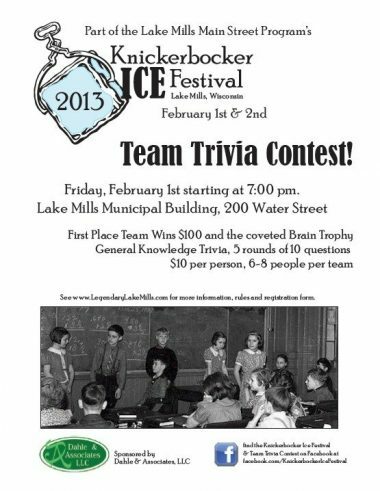 Kicking off the Knickerbocker Ice Festival weekend in Lake Mills, the Team Trivia is a great way to get your game on for the events following the next day! Team Trivia is held in the Community Room at the Lake Mills City Hall, and begins at 7pm sharp. Download the registration form from the website below. Teams of 6-8 will compete against each other for cash prizes and the honor of winning the BRAIN PRIZE! Food is available from The Grille Girl – a popular Lake Mills Farmers’ Market vendor. Come hungry – to eat and to win! The Knickerbocker Ice Festival in Lake Mills is everything you want a winter festival to be: 15 ice sculptors carving artistic masterpieces out of blocks of ice downtown; ice fishing and ICE GOLF on Rock Lake; a chili cook-off; horse & wagon rides; ice skating; ice wine; family games in the park, and much much more! Read all of the details at the website and in the article that leads off this newsletter! The Missoula Children’s Theatre is back again in Jefferson County for another great children’s production! 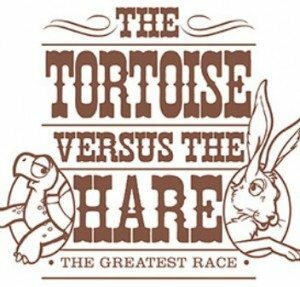 ioning local youth and ends in one amazing week with an hour-long musical adaptation of The Tortoise Versus The Hare. The annual race between the Reptiles and the Mammals is about to take place and we see there is more than sporting rivalry between the brown and green animals. Loyalties to the specific colors create a real animosity, until a tiny bummy is lost in the wilds of Tornado Gulch. Color is forgotten, as the mammals and reptiles join in the search together, and the wisdom of the old tortoise reminds the cocky hard that “color is just a color – it’s just decorated skin.” Catch this new twist on a classic tale! Enjoy the Jefferson Flea Market, where anything that can be found is there to be found! The eighth annual Dip for Dozer is scheduled for Saturday, February 9 at Lake Ripley Park in Cambridge. This is a fundraiswer to benefit the Dozer 52 Scholarship Fund. Join in the fun by forming a team to take the ice cold plunge. Other fun activities: turkey bowling, Kites on Ice and Ice Sculpting at 11am and Dipping Costume Contest at 1pm. Awards, raffles, food and music at the Rockdale Bar at 4pm. Sponsored by the Badger Bank. Come and participate in the First Annual Outhouse Race, held in honor of Kurt May, beloved barkeep and outhouse racer. Don’t be a party-pooper…enter your team today!! 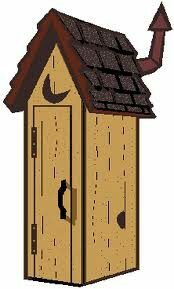 Build an outhouse of wood, cardboard, old car parts, etc. Install a toilet seat and a roll of toilet paper. Mount it on skis or runners – no metal allowed though! Two team members push it to win! Proceeds benefit the Dozer 52 Football Scholarship Fund. Join Cambridge for their big winter festival celebration of winter fun! The day starts out with CAP’s Get Out & Play Snow Day events, including FREE snow shoeing, cross country skiing, skating and sled rentals, plus cookies and cocoa at Westside Park. The fun continues at the annual Dip for Dozer plunge for charity, and the Outhouse Races at Kurt’s Place. See calendar entries above AND the first article in this newsletter for additional information. Join your friends for food, fun, exotic wines and beers! Win a vacation of a lifetime! Saturday, 2/9 from 4-7pm. A Jefferson Rotary event. See the website for additional information. Fun with fairytales is in store with this one! Is your name Harry or Sam? Or could it be Rumpelstiltskin? 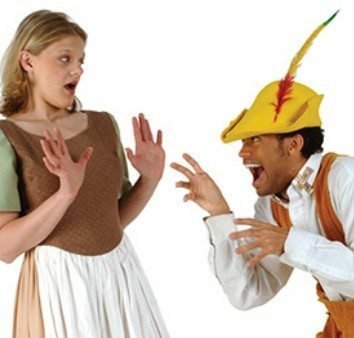 Help retell this classic tale of the miller’s daughter, her boastful father, a handsome prince, and the ability to spin straw into gold. Discover the magic and wonder of one of the world’s best loved fairytales. As audience members, you will have an opportunity to interact with the actors and explore the set. The Watertown Rotary Club invites the public to join them for brunch at the Watertown Country Club. The proceeds from the brunch support many community projects. The menu includes scrambled eggs, carved whole ham, sausage, roasted potatoes, pancakes, fruit, assorted coffee cakes, juice, coffee and milk. Tickets may be purchased for $10 from any Rotarian or at the Chamber office – 519 E. Main Street. Children’s tickets are available on request.